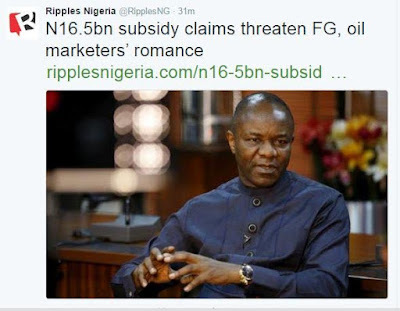 Modalities for resolving an outstanding N16.5 billion fuel subsidy claim may unsettle the fresh romance between the federal government and petroleum marketers, Ripples Nigeria has gathered. On Wednesday, the Minister of State for Petroleum, Dr. Ibe Kachikwu announced that the government was jettisoning the old pump price of N86.50k per litre for a new ceiling of N145 per litre. The pronouncement surprisingly received the immediate support of the umbrella bodies of oil workers namely the Petroleum and Natural Gas Senior Staff Association of Nigeria (PENGASSAN) and the Nigeria Union of Petroleum and Natural Gas Workers (NUPENG). Ripples Nigeria had exclusively reported that the endorsement of a price hike by the leadership of oil workers may not have been unconnected with the group’s move to win over the Buhari-led administration on the issue of outstanding subsidy payments. The report had also noted that with NUPENG/PENGASSAN support, the planned nation-wide strike to force a price reversal stood a risk of being still-born. While the rapport between government and oil workers appears to be gathering momentum, investigations show that there is a brewing discontent on how government wants to resolve outstanding subsidy claims estimated at N16.5bn at the end of April. At the root of the disenchantment is government’s appeal to oil marketers to forgo any further claims to subsidy since most of them still had very high inventory levels at the old rate of N86.50k, which when dispensed at the new rate of N145 leaves the marketers with sufficient profit margins to cancel out any claims to government indebtedness. A source close to the Ministry of Petroleum said, “We have reached out to industry operators and are on the verge of reconciling their claims against the huge stocks which they had prior to the new price regime. Investigations by Ripples Nigeria, however, show that marketers are displeased at what they consider attempts to deprive them of their earnings. A source who spoke on condition of anonymity said, “We think DPR and PPPRA are trying to play smart on this matter. If they had fore-knowledge of an impending price hike, what stopped them from auditing or reconciling our stocks? “We find their actions deliberate and will press home our demands for what is legitimately ours in due course. It is unfair to draw conclusions without relevant statistics,” he added.